This course provides a practical approach to delegation that can be readily used by managers to achieve results through their team. Below are some extracts from our Delegate to Succeed manual. Sometimes managers believe that they must delegate complete authority for a task before they can delegate at all. 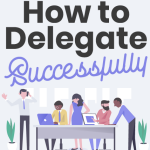 In actual fact there are “degrees of delegation” that can make it easier for supervisors to test their own ability to delegate effectively, or for them to monitor the degree to which they are comfortable delegating to new or previously untested employees. As a supervisor or manager, you decide which degree is appropriate by considering the nature of the task, the ability of the person doing the work, and the amount of time available to complete the task. The employee investigates and brings you the facts. You make the appropriate decision and take action. In this scenario, the employee investigates or researches, identifies options, and recommends a course of action to be taken. You evaluate the recommendation, make the decision, and take action. Investigate and advise on action planned. The employee researches, identifies options and decides on a course of action, complete with justification. You evaluate the decision made and approve or veto the action to be taken. Investigate and take action; advise you on the action taken. The employee researches, identifies options, decides which option is best, takes action, and advises you so you have a firm handle on what’s going on. The employee is turned loose. This is full delegation and displays your complete faith in the individual's ability. When should you delegate some of your work? After you have been in the job long enough to have a good grasp of what it entails. When you have completed a skills, abilities, and interests inventory of your team members. When you understand the value of delegating. Draw up a list of the current job responsibilities that you would leave behind if you were to suddenly leave your job. List the team members qualified to take over each of these responsibilities. If there is no one to take over a responsibility, leave a blank space. When the list is complete, add up the blank spaces to see what kind of department you would leave if you were suddenly out of the picture. The delegation meeting has eight specific steps to it. What are the consequences of the task not being completed on time for the organisation and the employee? How does the task fit into the overall scheme? How many parts are there to the entire project? Who is working on other parts? Provide context and relevance to the assignment. Why is it important to have it completed? Explain relative importance of the task. Focus on the results to be achieved, not the process or method for achieving them. Confirm understanding. There is always the chance the employee has misunderstood. Clearly communicate the performance standards by which the team member will be evaluated. This ensures that the team member knows what good performance is. This also means knowing how you will measure performance: Observations? Survey? Interviews? Reports? Presentations? These measures should be simple, reliable, unbiased, organized, and stable. Make sure the employee has enough authority to complete the task. Assigning a task without giving the employee the appropriate level of authority makes it unlikely the task can be accomplished. Delegated authority lets the team member spend money, direct or seek assistance, or represent the department. Communicate the level of support for the delegated task. What resources are available and who can help them with the task? Who can provide indirect help by suggesting other resources? What assistance can you provide? When will you be available to help? Be sure the employee knows what role you will be taking in this delegation and what they should come to you about. Give notice to others to inform them of the team member’s role. This establishes credibility and gives everyone involved a clear understanding of their respective roles. Obtain obligation and commitment from the employee for the delegated task. Don't leave an assignment with an employee unless you get a commitment for completion of the task by an agreed-upon date. Make clear the assignment belongs to the employee, and that he or she must resolve any problems that arise, or at the very least bring options for a solution when he or she comes to you with the problem. Establish rewards and recognition. Be sure to notice the employee's performance. If recognition is never forthcoming, they will decide that good performance doesn't make any difference, and others will not be motivated to accept delegation either. Identify milestones in the project or task and then develop a system for tracking what tasks are assigned to whom and when they are to be completed. Studies show that informal methods of follow-up are most effective. An assignment you ask about frequently is more important than the one you mention once but never monitor. But your interest must be sincere to be effective. It’s time-consuming but the very fact that you take the time tells the team member that completion is important. Depending on the type of work, you may ask for a sample of the work to monitor quality, such as a report, or sit in on a meeting the employee is chairing. Similar to a tracking log, except this time the onus is on the employee to include steps taken and difficulties in execution. This is based on the idea that controls are only needed when there is a deviation from set standards. In this way, you focus on unacceptable problems rather than try to monitor everything. However, don't use this method if difficulties are hard to spot, a single error could be significant, or the employee is inexperienced at the task.